As children, we’re instructed not to eat with our hands. But at Teff, a newly opened Ethiopian and Eritrean restaurant in Stamford, CT, you’re supposed to do just that. On the brink of Harborview and a stone’s throw away from downtown, Teff’s location is ideal. It sits in the space that formerly housed the Red Sea Deli. The Mekonen family owned the deli for 14 years. Although they mainly served classic American fare there, they offered Ethiopian food from Thursday-Saturday. The concept led to the creation of Teff, which officially opened for business on July 30. Hadas Mekonen, matriarch and chef, grew up in Eritrea, a small country that used to be part of Ethiopia. She was the third oldest in a family of 16, so learning how to cook was essential to help provide for the family. At age 9 she started observing how her mother browned and prepared the spices. From there, she learned how to cook entire dishes. Cooking was a process. In addition to creating all of the spices from individual components, they had to retrieve water. “There was no running water. Every morning we took the camel down to the river,” she reflected. She moved to America in 1986 with two of her children, her oldest daughter and son. She used her love of cooking to get a job at the Marriot’s cafeteria. However, she did not speak English so making her way upward was a hurdle. Her persistence and hard work paid off. In a year and a half she had mastered everything and started moving up. After 4 years, she had rotated through the entire kitchen. She went on to open her own business and buy a home with the money she had carefully saved. Today, Teff is a family affair. Hadas and her oldest daughter cook. Her son Senay manages the floor while her daughter Elsa oversees the operations. The name refers to a grain found in Eritrea and Ethiopia. The diet staple is a nutritional powerhouse with iron, calcium, protein, amino acids, and potassium. Alone it is gluten-free. It is ground into a batter known as “beyhouk” and then rolled out in a crepe-like fashion. The result is a thin bread called “injera” that has small spongy holes for scooping food. At the restaurant, they mix the batter with a small amount of white flour for two reasons. First, the grain behaves differently here than in its natural climate and the addition helps it rise properly. Second, the unaltered form of the grain can come off as a bit “bitter.” The white flour makes it more palatable. Teff does have the gluten-free version available for patrons who ask. The menu has a few starters, but at its heart are vegan and meat entrees. In Eritrean cuisine, entrees are not one large dish but rather a dish with several components. Each entrée comes with two tasting sides of vegan dishes of your choice and are served on top of injera. Diners can also opt for the “tasting” menus that come with a number of tasting portions of the dishes to try for one, two, or three people. For my meal, I selected the “Dorho Aletcha,” chicken leg and thigh slow simmered in a mild jalapeno sauce and served with a hard-boiled egg. I decided on the “Dinich” and “Birsin” as my vegan sides. They were potatoes, okra, and zucchini in a berbere sauce and whole brown lentils simmered with curry and herbs, respectively. We noticed that almost all of the descriptions included the word “slow” – slow simmered, slow cooked. Each morsel was delicious and flavorful. The spice combinations were utterly incredible. The berbere in my Dinich had a peppery kick. Cayenne pepper is the base for berbere, a common component in Ethiopian food. The large pepper is dried, ground up, and seasoned with garlic and other items. The chicken and jalapeno mixture proved unique and delicious as well. And lentils, which I once perceived as bland and unexciting, were anything but. “Everything has some form of jalapeno, some form of spice,” Hadas told us. Spiciness levels are clearly marked on the menu and range from mild to hot. The majority of the ingredients must be shipped from Ethiopia and Eritrea because they are uncommon here. Fortunately, there is a farm in Idaho to provide the teff. The superfood has increased in popularity in recent years, propelling an Idaho farmer to invest in importing the crop. The farm is pretty much the only place to get it though because the Ethiopian government is restrictive about the amount that leaves the county. Currently, the menu’s meat options center on beef and chicken. However, Senay told us they plan to add lamb, goat, and fish in the coming weeks. He reveals that lamb and goat are most common back home, while very few Eritreans actually eat beef or seafood. He told us they are considering expanding the menu to include a salad and pasta section as well. He gave us a quick history lesson that informed us that Eritrea was colonized by Italy for decades. As a result, one can see Italian influence in the language and the cuisine. Pasta, paired with Eritrean sauces, would be an appropriate and natural combination. The space is just as thoughtful as the cuisine. Senay and one other individual built it all themselves. The Red Sea Grill closed for a year and a half while they redesigned the spot to include a coffee bar, full-length picture windows, a leather booth lining the wall, and gorgeous wooden paneling. Sunlight streams in the windows and bounces off the pale green walls. Colorful photographs depicting the process of harvesting teff adorn the walls. Teff currently serves dinner starting at 5pm. So far, there are no plans to serve lunch because of the time that goes into preparing the food. They are considering holding a large breakfast-inspired event in September. 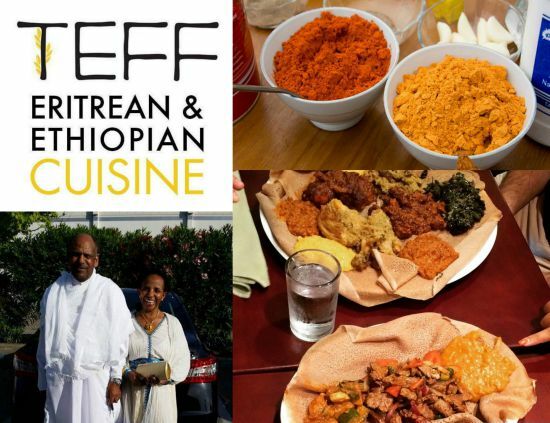 Teff is a must-visit culinary destination for people of all backgrounds. Vegans will find an incredible range of unique and flavorful options. Those focused on nutrition should stop by as well; the cuisine hinges on superfoods packed with vitamins and nutrients. And, most importantly, it’s a one-of-a-kind experience for anyone looking for a fun night out. The Mekonens are warm and inviting, the food different and spectacular. From couples, to families, to a single diner, anyone can derive joy from a meal there. Hadas shows that with hard work comes success. I wish them great success in their new venture.